We are very excited for our puppy plans in 2019.
and also a couple litters later in the year. We are planning on a very special breeding this Fall 2016. We screen potential puppy homes to make sure they are the best homes for our babies. Likewise, we urge puppy buyers to make sure that they are getting their puppy from a reputable breeder. We had a beautiful litter of 7 (5 boys, 2 girls) born on Oct. 20, 2007. The mother is CH. Firecloud's Devil 'N the Deep Blu C, "Lucy" and the father is CH. Vanderbilt's True Lee, ROMC. All the puppies are in their new homes and doing well. We had a litter in the Spring of 2009 and they, too, are all in their new homes. 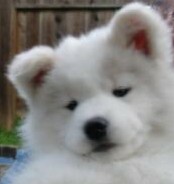 if you are interested in a Firecloud puppy. We screen potential puppy buyers to make sure our babies are going to good homes.